It is known that a mutation induced by heavy ion beam irradiation differs from that by X-rays or γ-rays. From studies using animal cells and mice, it has been clarified that heavy ion beam irradiation causes a DNA double strand break, inducing a DNA deletion mutation. We applied heavy ion beams to plants and found that this can be a highly promising breeding technique. This invention is inspired by the development of cancer therapy using heavy ion beams that was conducted by the collaborative research team of RIKEN and the National Institute of Radiological Sciences of Japan. We have conducted a pilot research project from 1996 in collaboration with private companies and agricultural experimental centers and found many examples in which mutations were induced in only a single trait, and the mutant traits were stable. 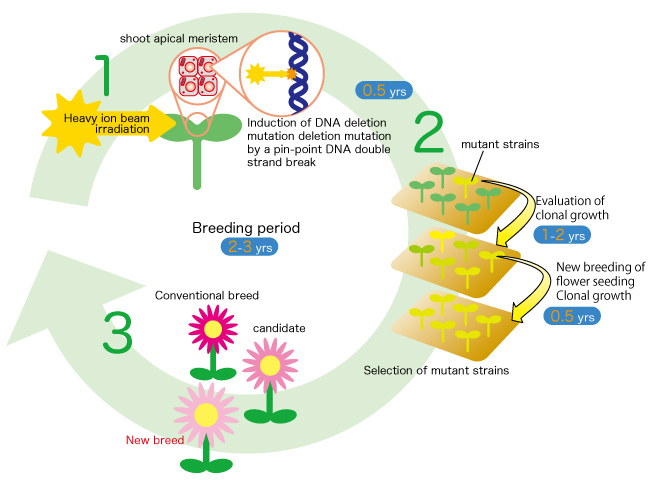 These mutants themselves can be new breeds or hybrid parents, suggesting that a significant reduction in a breeding period, which is about 10 years in general, may be achieved. 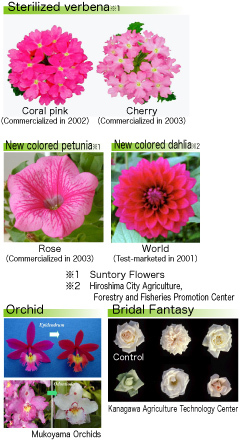 We have developed a new breed of dahlia that exhibits new color using irradiated vegetative materials with heavy-ion in 1998 and test-marketed it in the fall of 2001. In 2002, we also commercialized a sterilized breed of verbena as the world’s first heavy-ion-beam breed. The number of user groups that want to use our accelerators to improve breeding has now reached 82. Moreover, this technique has attracted international attention: we have irradiation requests from Korea for vegetables, rice, and wheat; from Australia for wheat and rice; and from South Africa for grains. 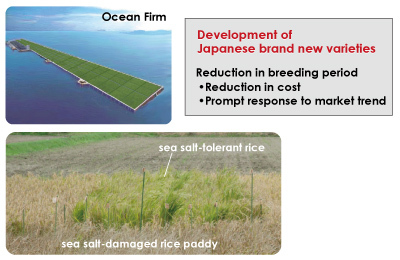 The economic effects due to the reduction in breeding period for developing new varieties using the heavy-ion-beam breeding technique, and the introduction of brand-new Japanese varieties can consolidate Japan’s leadership in this field. In addition, this technique can alleviate a number of concerns: the deterioration of the environment through the development of wasteland afforestation plants, sea salt-tolerant plants, sterilized plants that will not disperse mutant pollen, and enhanced photosynthesis plants. This technique was also applied to develop new varieties of cherry blossoms in collaboration with JFC Ishii Farm. They are Nishina Zao, which bears pale-yellow flowers, and perpetual cherry blossom Nishina Otome. 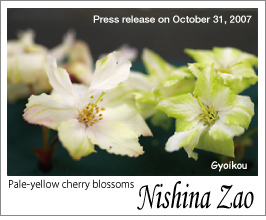 Nishina Zao was developed by applying heavy ion beam produced at a RIKEN’s accelerator Ring Cyclotron onto Gyoikou cherry, which bears slightly green flowers, to induce mutations. Nishina Zao bears pale-yellow flowers, which are edged by yellowish-pink with stripes of bright greenish yellow. They color pale-yellow whitish-green in the beginning of bloom; then pale-yellow pink color spreads toward the end of bloom, showing beautiful changes in color. The time of bloom is in general around mid-April, continuing for about two weeks, which is rather long for cherry blossoms. The size of the flower is about 4 to 5 cm, and petals are partially overlapped, which differentiate it from its parent, Gyoikou cherry, resulting in a new variety. Nishina is named after Yoshio Nishina, the father of RIKEN’s accelerator in Japan, and Zao is named after a geographical name Zao in Yamagata prefecture where our collaborator, the JFC Ishii Firm, is situated. Nishina Zao was named by the director of RIKEN, Ryoji Noyori, who won the Nobel Prize in Chemistry in 2001. Three nursery trees were donated to Satosho, Okayama prefecture, where Yoshio Nishina was born, and five were donated to Wako, where the RIKEN Nishina Center is situated. Nishina Otome was developed by applying heavy ion beam produced at the RIKEN’s accelerator Ring Cyclotron onto Yamagata 13 Keiou cherry to induce mutations. Nishina Otome bears pretty pink flowers, whose petals are not overlapped. In general, Japanese cherry blossoms sprout buds in summer, which stay dormant in late fall. They need to be woken up from this dormancy by the winter cold to bloom. They start to grow in early spring and then bloom. The parent Keiou cherry needs to be exposed to low temperature environment under 8°C for about 1000 hours to “wake up.” However, such low temperature is not required for Nishina Otome to be woken up. 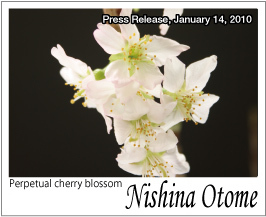 In other words, the most significant characteristic of Nishina Otome is that it can bloom without being exposed to cold. Nishina Otome blooms twice a year, April to July and September to November, in the field. In a greenhouse, however, it blooms in various time periods throughout the year depending on individual trees. However, it does not bloom in midsummer when the temperature exceeds 30°C and midwinter below 5°C. Moreover, if it is exposed to cold or sheds its leaves, it will bloom. In that case, the number of flowers is three times higher than that of Keiou; the flowers are beautiful, and the blooming period is extended to four weeks, which is twice longer than that of Keiou.